Five Wonderful Wednesdays in a row! I feel so proud. Seriously though, this week I need a little dose of the Wonderful Wednesdays. I'm sitting typing this on Tuesday evening and today has been looong. Heaps to do combined with a surprise lunch time webinar left me with a thumping headache by about 4pm. I need to pop out for some fresh air at lunch time or the day just feels ten times longer! Although, if I had popped out at lunchtime today, I'd probably have been caught in the sudden snow flurry that I spotted out of the window. Snow?! It's the end of April! 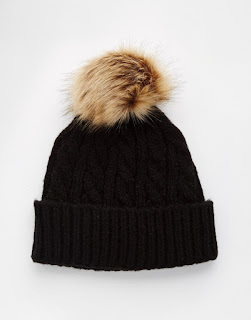 Thank goodness I've ordered a new bobble hat - May, I'm ready for you! 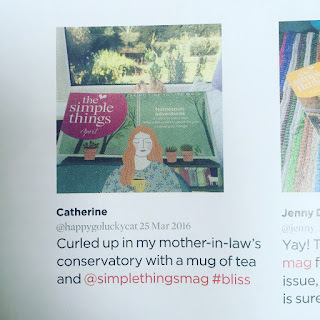 ♥ New issue of the Simple Things... The mister bought me a subscription to this wonderful dose of monthly cosy for Valentine's and the newest issue dropped through the door last week. I was so excited to see that my little snap of last month's new issue was featured in their 'where do you read yours?' section! Seeing the photo brought back wonderful memories of when the photo was taken too - curled up in my mother in law's conservatory, sipping tea and looking out at her beautiful garden during the Easter holidays. A real reminder of lovely times with family. ♥ Yoga... Don't hate me, guys. I got up on Sunday morning and did half an hour of yoga before breakfast. Then, over the last few days, I've hopped straight onto my yoga mat when I get home to do a quick session before dinner. I'm feeling really good about it, if slightly achy too. There's a website called Yoga With Adriene and she has lots of great sessions which are free on YouTube - including an energising morning session, a relaxing bedtime session and one for anxiety and stress, which may get a regular airing! Don't worry though, I haven't gone full zen just yet...I may have been spotted less than an hour later on Monday evening eating Nutella from the jar with a spoon. Totally earned that Nutella though. ♥ Barbican Saturdays... The mister and I had a fantastic day on Saturday in and around Farringdon/Barbican. We love going back to Farringdon anyway because it's where we got married, in a beautiful little old church, and so being back in that area always brings back such good memories, including the constant wish to be guests in the fabulous little boutique hotel we stayed at on our wedding night. This Saturday we went to a superb photography exhibition at the Barbican - Strange and Familiar: Britain as Revealed by International Photographers - an array of snapshots of Britain captured by some great international photographers. Some of the subject matter was wonderfully familiar, other images were of a Britain I've read and thought about but never seen before, but all somehow recognisable. We spent a glorious few hours wandering around looking at all the images and I discovered some new photographers that I'd never heard of before, amongst the work of Cartier-Bresson and Robert Frank that I know and love. If you're in London, definitely check it out. ♥ New series of Game of Thrones... Do you watch it?! Wasn't it good?! I'm so excited that it's back at last and if the first episode is anything to go by, the series is going to be a great one. ♥ My little herbs...are starting to show some little shoots! The basil in particular - there are green shoots popping up all over the pot. On Tuesday we spotted one lone little shoot in the chives pot. No sign of any parsley shoots just yet but the seeds have only been planted a week so it's still early days...not that it stops me anxiously examining every little inch of the soil when I come home from work each evening. It's so exciting to spot the little shoots! ♥ My new bobble hat! If you read this post, you'll know that my fringe has remained firmly pinned back over the last week to try to avoid the frizz. I had a particularly cold forehead walking home this evening. I decided to order a new bobble hat over the weekend because it's the only full-proof solution I have to frizzy hair and it arrived today! I'm ready for you, summer! Do let me know what's made your week a little rosier by leaving me a comment below (I do love comments!) or dropping me a tweet (I'm @happygoluckycat) or better yet, why not join the fabulous bunch of #WonderfulWednesday bloggers? Pop over to their blogs for a dose of mid-week happiness - Sally, Michelle, Helen, Kate, Jo, Emma and Kate - and then join me in counting down the days until the weekend. It's in sight! Oh that bobble hat is a thing of beauty. And thanks for not spoiling, I STILL haven't done GoT this week yet. I don't know what's wrong with me!! I adore Yoga with Adriene - she really does know how to make you work hard but the wind down always makes it worth it. Must keep it up! Such a sweet little list of happy! I adore the Simple Things - has to be the only magazine that i've ever come across that i read cover to cover and then backwards and then forwards again and quite often pick it up and just pick odd thing to re-read - that is a big testament it being all digital out there now. Sorry to hear you're having one of 'those' weeks - you sound like you're kicking it's arse though - Yoga and Nutella you say? Life's all about balance. I rode three miles on my bike this morning and i've just eaten the most delectable chocolate brownie washed down with my favourite tea in my favourite mug - happy days! Ahh thank you for your lovely comment! Yes I really love the Simple Things - I keep all my back issues and often pick them up for a browse. Hello to that hat! That looks just perfect for the weather we've been having. I think I might invest in one, what with having to work outside all the time. I'm always a little scared I'll look like a boiled egg in a wooly hat. I think we all have weeks like that, hopefully the sun comes out and your week peps up. Those green shoots and a huge pile of wonderful wednesday will have you smiling in no time. That exhibition sounds great. I'm so blimming nosy that seeing new places and the familiar in new light. An exhibition is sure to give me lots of inspiration and this one sounds no different. I'm sure you can work a cosy wooly hat :) Whoever would have thought that we'd be buying/considering buying wooly-wear in May?! It was a fantastic exhibition, really recommend it if you're in London in the near future!